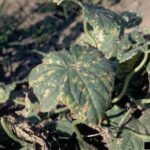 Cucurbit downy mildew can destroy your tasty crop of cucumbers, watermelon, squash, and pumpkins. The fungus-like pathogen that causes this infection will trigger some characteristic symptoms in your garden, so know what to look for, catch it early, and take steps to manage the disease to save at least some of your harvest. Cucurbits, which include the previously mentioned crops as well as melons and zucchini, are a group of plants that together make up a big portion of many people’s gardens. If you grow anything from the cucurbit family, your harvest could be limited or destroyed by the onset of downy mildew. A pathogen that is similar to fungus, called Pseudoperonospora cubensis, causes cucurbit downy mildew. The symptoms of an infection are seen in the leaves. Look for angular, yellow or brown spots on leaves, bounded by the leaf veins. This looks similar to leaves affected by angular leaf spot. You may also see a velvety, downy substance on the undersides of the leaves, especially early in the morning. This growth contains the pathogen’s spores. You may not see the angular spots on the leaves of melons, but check for the growth on the undersides to identify an infection. Cucurbit plants with downy mildew are at risk of dying. Even those plants that do survive will have reduced or non-existent yields, and this can happen within just a couple of weeks of the start of an infection. It is important to catch the infection early or take steps to prevent it. Environmental conditions that favor the pathogen are cool, humid, and cloudy. Minimize development by making sure your plants are spaced well enough to allow air to move through and dry out moisture. Avoid watering when conditions are humid or in the evening when the moisture will stick with the plants through the night. 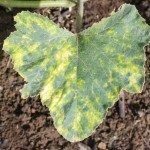 It may also help to plant your cucurbits earlier in the season, as the downy mildew infection tends to set in later in summer in many locations. 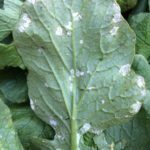 If you do see signs of cucurbit downy mildew in your garden, remove and destroy affected leaves or entire plants if necessary. If this does not stop the spread of the disease, you may need to use a fungicide. One that contains chlorothalonil will kill the pathogen that causes downy mildew. Stopping this infection isn’t easy because it spreads rapidly. As a last resort, pull all your affected plants and destroy them. The pathogen will not survive a cold winter, so you can start again next spring using preventative strategies to avoid the infection.